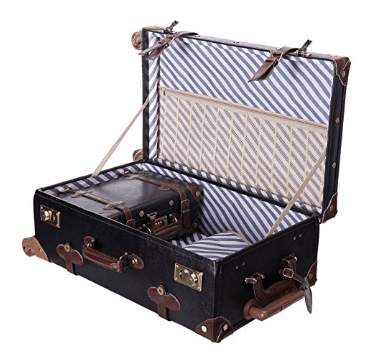 CO-Z Premium Vintage Luggage Set is made up of a solid 24-inch trolley suitcase and a 12-inch train case set. It is offered in six different color options of black, blue, brown, pink, rose and white. And there are small price differences, with black (BK0001) being the cheapest and the pink (CO-Z0102) the most expensive. Please note that the shipped package will show the contents. The packaging weighs 17.6 pounds and measures 28.8 x 16.8 x 9.7 inches. And if you prefer it not indicated, then choose the “Ship in Amazon box” option. You will get the 12″ bag fitted into the 24″ suitcase and you can store it this way too. This is a very solid and good quality set of two bags of heavy duty PU material with hand crafted stitching. And they look sleek and stylish with a beautiful classic vintage design. Despite being very robust, the suitcase and the bag are not heavy so you do not go over your luggage allowance at the airport. You can easily use this set if you’re going away for a couple of days or a week- more for shorter stays. The large 24-inch trolley suitcase weighs 10.7 pounds, has a 37 liter volume with the measurements of 23 x 14 x 9 inches. And the 12-inch train case is much smaller with only a 3 lb. weight, a 5 liter volume and the dimensions of 12.4 x 5.1 x 8.2 inches. 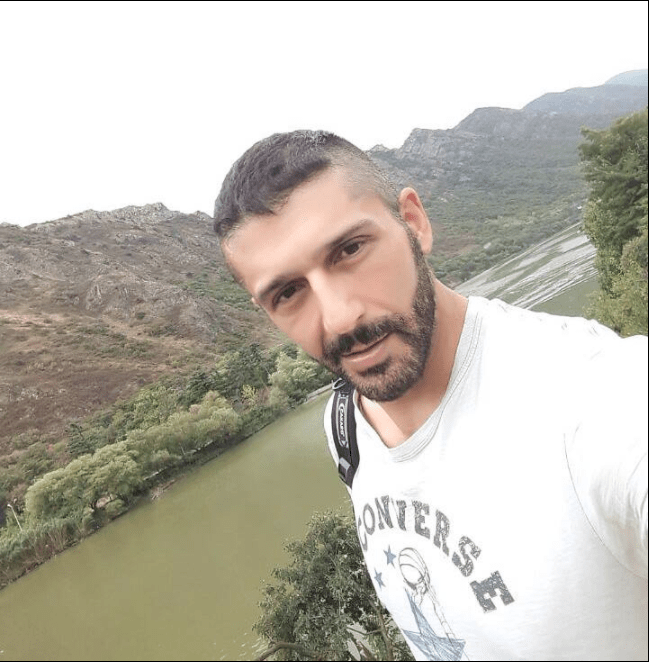 The large bag has four very solid spinner wheels and with the metal handle you can move it smoothly in different directions smoothly and effortlessly and with as little noise as possible. The maximum height the metal handle can reach is 41 inches, which is plenty for most adults. You can attach the small bag to the suitcase with a strap provided in the package. The large bag has two TSA locks and the small case has a 3-code lock. The code for the small bag is 0000 when you want to unlock it for the first time. With the TSA locks the luggage staff can open and check your bag without breaking the lock. You’ll find two pockets each in the suitcase and the train case so you can organize and store your stuff better. 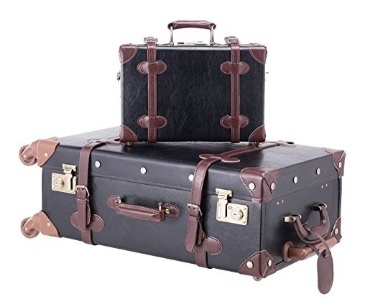 This luggage set has a different design than the luggage sets you may be used to, it is more of a vintage and luxury style and not average by any means. Both the suitcase and the bag look and feel premium, are built very solid and should hold up well to many years of frequent traveling. You have two handles on the 24-inch bag, and one of them is adjustable. The smaller bag is designed for your valuables. Both bags are water-proof so the rain will not go in and both are very easy to clean. Please note that the 24-inch bag is bigger than the usual airline carry-on luggage allowance and you would need to check it in. But you can certainly take the 12″ train case on the plane. Please also note that the suitcase and the bag are smaller than they look in photos and this is what many of the negative reviews online are about. But otherwise this is a very solid and durable set with a pretty vintage design and a premium feel overall. The suitcase and the bag are nothing like the ordinary luggage and with a higher price tag, they are more of luxury items to have.